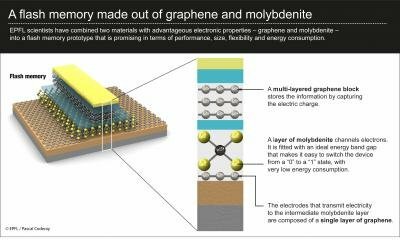 Researchers from EPFL designed a new flash memory cell prototype that is made from graphene and Molybdenite (MoS2). They say that the new design is efficient, flexible, small and fast. The idea is that the unique electronic properties of MoS2 (it has an "ideal energy band") are combined with graphene's excellent conductivity. The EPFL design uses field-effect geometry. A thin layer of MoS2 is in the middle layer that channels electrons. The electrodes on the top and the bottom are made from graphene. Molybdenite, a common mineral, was found to be an alternative to silicon and is better than graphene in its electronic properties. The material was first studied at the EPFL in 2011. The researchers already demonstrated that an efficient Molybdenite chip is possible, and now we know that it's also possible to use it to create flash memory cells. Molybdenite, a new material challenges Graphene?